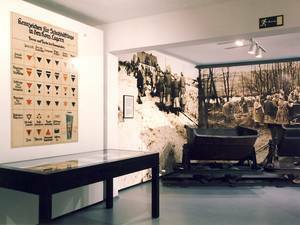 The exhibition “Ravensbrück. The Topography and History of the Women’s Concentration Camp” in the former commandant’s headquarters provides information about the genesis, construction and history of the Women’s Concentration Camp which the SS had built starting at the end of 1938 in the vicinity of the Fürstenberg/Havel heath resort area. 132,000 women and children and 20,000 men were imprisoned here as well as 1,000 young women and girls in the “Uckermark Youth Protection Camp”, called so euphemistically by the National Socialists. The structure of the camp’s daily life, the concentration camp prisoners’ forced labour in the SS’ own textile factory, as well as in the industrial facilities which were located right next to the concentration camp that the companies Siemens & Halske had built are also presented here.